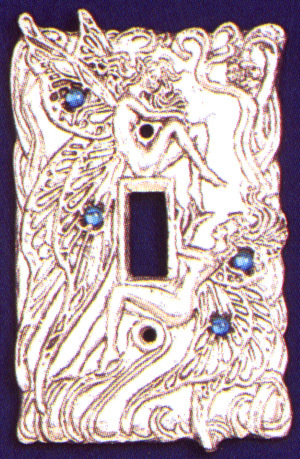 One fairy tickles the foot of the other as they play amongst the leaves on this fantastic light switch plate! The wings of the fae are decorated with Austrian crystals, and are sure to add a shimmer and a touch of magic to any room! Made by hand from lead-free pewter to fit all standard single switchplates.